WASHINGTON, DC, December 6, 2015 (ENS) – The 2015 meeting of the United Nations Framework Convention on Climate Change, UNFCCC, is just past the halfway mark. Although many observers expect the meeting to be extended a few days, Friday, December 11 is the last official day of the 12-day gathering. The goal is to establish a universal, legally-binding agreement requiring all countries to reduce their greenhouse gas emissions to levels that will cap planetary warming at two degrees Celsius above pre-industrial levels. Around the world, climate change is now front page news. Politicians, corporations, pundits and concerned citizens are weighing in with reports, commentary and predictions. 1. Paris is not the first nor the last climate summit. In fact, Paris is not a climate summit at all. The Paris talks are actually a combined meeting of the parties to the UNFCCC (COP21) international treaty and to its progeny, the Kyoto Protocol (CMP11). COP21, the name of the meeting in UN-speak, is the 21st annual gathering of the signatories to the 1994 UNFCCC, now ratified by 195 countries. 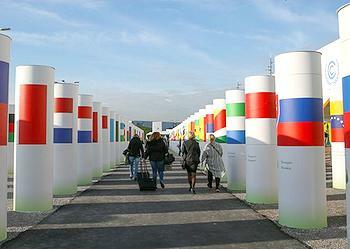 The CMP-11 gathering is the 11th annual meeting of the 192 Parties to the Kyoto Protocol. Adopted in Kyoto, Japan in December 1997, the protocol entered into force in February 2005. Paris is not the end of the international climate change negotiations. In fact, the 2016 climate meeting, COP22, is already scheduled to take place 11 months from now, November 7 to 18, 2016 in Marrakech, Morocco. At the end of COP-21, President Francoįse Hollande will hand over responsibility to H.M. King Mohammed VI. COP23 (2017), COP24 (2018), and COP25 (2019) are also scheduled with locations to be determined. 2. 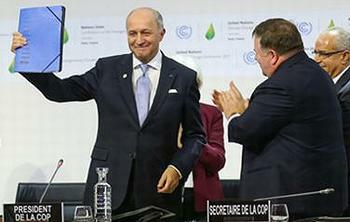 Any agreement made in Paris will not be effective until 2020. The effective date for the adoption of any legal outcome of the talks was decided by the Parties in 2011 at COP17 in Durban, South Africa. There, governments agreed that a fresh start was needed to close the “looming gap” between the world’s commitments and any reasonable scientific vision for a world safe from greenhouse gas emissions. This draft document was to be completed no later than 2015 for adoption at COP21 and implementation from 2020. After more than three years of meetings, in early October 2015, the working group released a 34-page draft. Everything in brackets in the draft text – and that is a lot – requires additional negotiation. That is the task of the delegates at the Paris talks. On Saturday, the working group submitted the latest version of the draft agreement. This text, adopted following a week of wrangling among negotiators from around the world, is 48 pages long and has a great number of bracketed options that the ministers will need to decide from Monday onwards, to achieve the adoption of a universal pact by next Friday. “The work is not complete, and major political issues need to be decided on. We will need all our energy, intelligence, capacity for compromise, and ability to think long-term if we are to achieve our result,” said French negotiator Laurence Taubiana. On Sunday, COP21 President Laurent Fabius convened a team of 14 facilitators representing all official negotiating groups, who will be responsible for helping him throughout the coming week in order to ensure a successful outcome to the negotiations. 3. Every country’s efforts to implement any UNFCCC decision depends upon domestic politics. It is helpful to recall that in the United States, federal legislation is normally approved by a simple majority vote of the Senate and the House of Representatives. However, international agreements undergo a different process. The legal form of any agreement reached in Paris is critical to U.S. participation. If the agreement form is controlled by the Treaty Clause, Senate approval by a super majority would be required. Observers consider any such approval highly unlikely, at least until 2017, after the electorate chooses a new President and Members of Congress next November. Add to the U.S. political landscape the politics of 194 other countries and the likelihood of a long-term worldwide collaborative effort is uncertain. 4. The world is not waiting for national governments to act. Thousands of projects around the world already are fighting global warming. Both public and private actors are not waiting for 195 countries to agree on the problem and fund solutions. COP21 publicizes many of these programs. Several hundred 90 minute-long discussions, or “side events,” are scheduled throughout the 12 days. These are sponsored by governments, universities, non-profit organizations, and other civil society groups. Speakers from around the world include scientists, farmers, university professors, government experts, and non-profit organizers. Topics range from low-carbon shipping in Denmark to waste disposal in the Philippines, to climate-induced migration. Global public-private partnerships are forming. On the first day of the Paris talks, 20 countries – including the United States, India, and China – announced Mission Innovation, a commitment to invest more in clean energy research. At the same time, a group of private global investors, including Microsoft’s Bill Gates, Facebook’s Mark Zuckerberg, and Amazon’s Jeff Bezos, announced the Breakthrough Energy Coalition, an agreement to create businesses based on the government research. And, the UN has not forgotten the role that cities can play. Last year in an effort to invigorate the talks and enhance political will, UN Secretary General Ban Ki-moon appointed a Special UN Envoy for Cities and Climate Change, U.S. technology billionaire and former NYC Mayor Michael Bloomberg. The hope is that Bloomberg can focus cities, again in partnership with the private sector, on the economic and social rewards of low-carbon activities.